What is a HIFU (High Intensity Focussed Ultrasound) treatment ? HIFU or High Intensity Focused Ultrasound is a safe, non-invasive technology that uses body’s own regenerative response to tighten the skin and tone the superficial muscles of the face, neck and under the chin (double chin). How does HIFU (High Intensity Focussed Ultrasound) work ? As the skin matures, collagen fibers lose elasticity and the muscles that provide internal support lose their tone. The HIFU (High Intensity Focussed Ultrasound) treatment delivers focused thermal energy at optimal temperature to the dermis and Superficial Muscular Aponeurotic System (SMAS) to cause muscle tissue contraction and collagen regeneration. The treatment kickstarts a natural process, known as neocollagenesis, to produce fresh, new collagen. Is HIFU (High Intensity Focussed Ultrasound) Safe? What happens during a HIFU (High Intensity Focussed Ultrasound) treatment? Ultrasound gel will be applied to cleansed skin. The handpiece will deliver ultrasound energy beneath the skin. During treatment, you feel the warmth of the handpiece. You may also feel a slight vibration and tingling sensation, especially over the bones which is completely normal. Each treatment generally lasts an hour. No. After your procedure, you can resume your normal activities immediately, without having to follow any special post-treatment measures. What happens after HIFU (High Intensity Focussed Ultrasound) treatment? There is practically no downtime after a HIFU treatment. The effects of collagen production takes 1 to 3 months to complete. The effects can be maintained for a year after completing a series of treatments. Is HIFU (High Intensity Focussed Ultrasound) treatment painful ? Comfort thresholds vary from person to person. Most patients tolerate the procedure well and experience from a warm to hot sensation during the procedure. This is temporary and in fact a positive signal of collagen remodelling. Who is the best candidate for HIFU (High Intensity Focussed Ultrasound) treatments? HIFU is perfect for someone who is considering (facelift, neck lift, brow lift) but is not quite ready to take that step and wishing to avoid the risks, cost, and downtime associated with facial surgery. Also it is best suited for people in their 30’s-40’s where aging had begun but not progressed to advanced stages. What about side effects of HIFU (High Intensity Focussed Ultrasound)? There are practically no side-effects after a HIFU procedure. A few patients may experience a temporary dull ache especially along the jawline. HIFU skin tightening is clinically proven to be safe, with natural and gradual rejuvenation effects. Most clients need 3 sessions at a gap of 1 month between sessions. When will I start seeing the results ? Results will completely take effect over 1 to 3 months or even up to 6 months following treatment. Your body will continue to produce fresh collagen over time. The results last for 1 to 2 years. After that, you may wish to continue maintenance treatments once a year. The results are permanent, as long as you maintain your weight with your normal diet and exercise; your long term results should remain stable. How is HIFU (High Intensity Focussed Ultrasound) different from lasers ? HIFU (High Intensity Focussed Ultrasound) uses ultrasound energy, that bypasses the surface of the skin to reach the deeper dermis. Lasers rely on light energy, which typically treat superficial skin issues like texture, color and finelines. Since the two technologies often treat different layers of skin, they’re actually complementary. 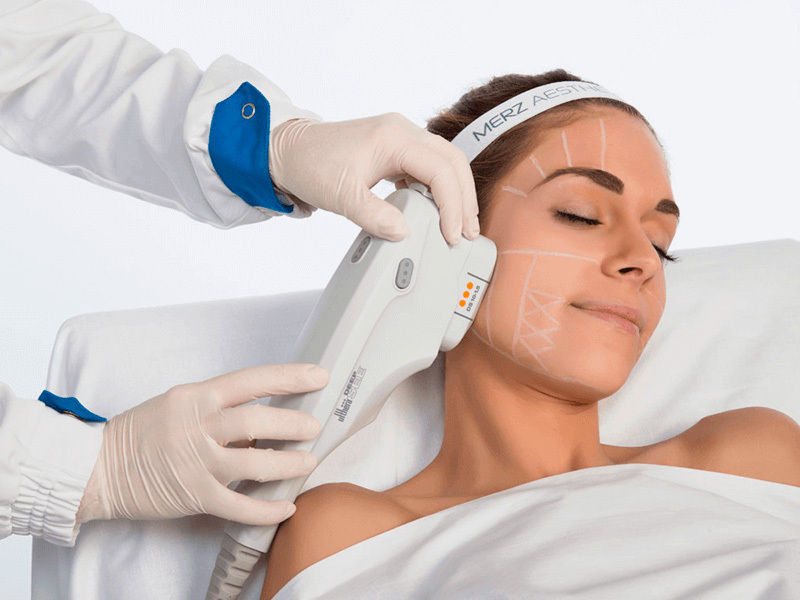 Can HIFU (High Intensity Focussed Ultrasound) replace a Face Lift Procedure? HIFU (High Intensity Focussed Ultrasound) treats the same deep foundational layer addressed in cosmetic surgery, but won’t duplicate the results of a facelift. However, it is a great alternative, especially for those not ready for surgery or for patients looking to extend the effects of cosmetic surgery.